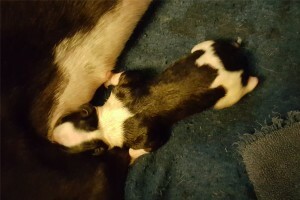 Mercy’s first litter arrived the night of July 29, 2016! Mercy & Co., marked by gender and birth order, on their first day “out”. 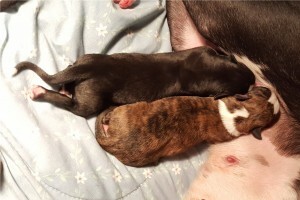 We are beyond thrilled with these little lovelies and their little mama, even though she gave us some new gray hairs, I’m sure! Mercy kept me on pins and needles for four days, with temperature fluctuations and other teases as we waited for active labor to begin. It finally began in earnest just as we were about to have dinner on the evening of the 29th, but I did get to eat as I watched over Mercy. 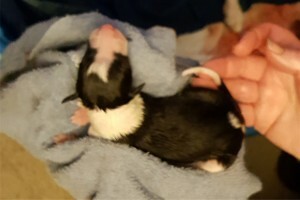 The first puppy finally made his appearance at 9:33 PM, and we were kept pretty busy for the next four hours as six more were born. 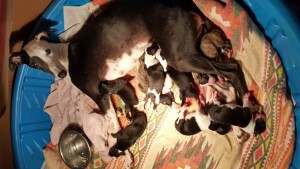 By 1:30 a.m., we had seven adorable and vigorous little pups, and one thoroughly exhausted mama Mercy. There was a slimy, wet bundle by Mercy’s back end. 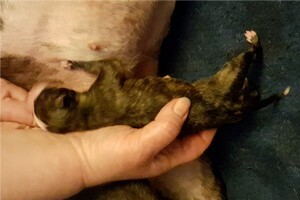 At first I thought maybe a pup had rolled itself in her bloody discharge, but as I looked closer I saw that it was a new puppy – still in its sac! 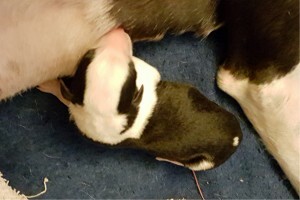 I called out to Bill and went to work getting the puppy out and warmed, working carefully to dislodge and remove some amniotic fluid and mucus from his mouth and nose. 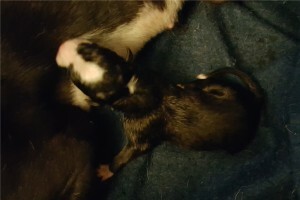 He soon started breathing and squirming, and only needed a little help to try suckling. 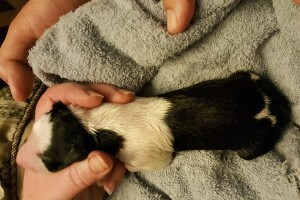 I was working to dry and stimulate him, carrying him as I went to get another towel, when Bill called for me to come back – there was yet another puppy coming! 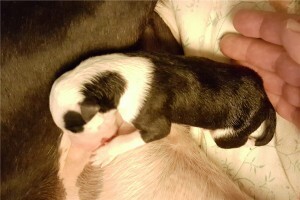 I handed off little #8 to Bill, and helped poor Mercy deliver #9, who was coming rear-feet first. 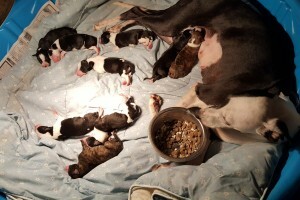 When the final two little boys were actively nursing, we were able to return the rest of the pups to the pool with their mama and return ourselves to our own bed sometime after 6 a.m. What a night! 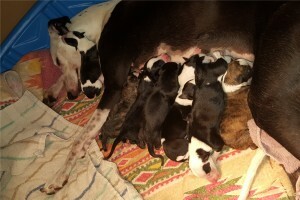 Exhausted Mercy & 9 little bundles of joy (one is hiding underneath). Several hours later, all doing well. 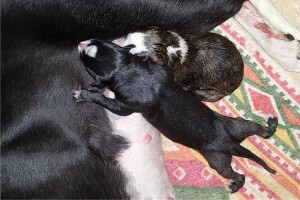 A closer look at our little surprise pups, #’s 8 & 9, with nice, round bellies.